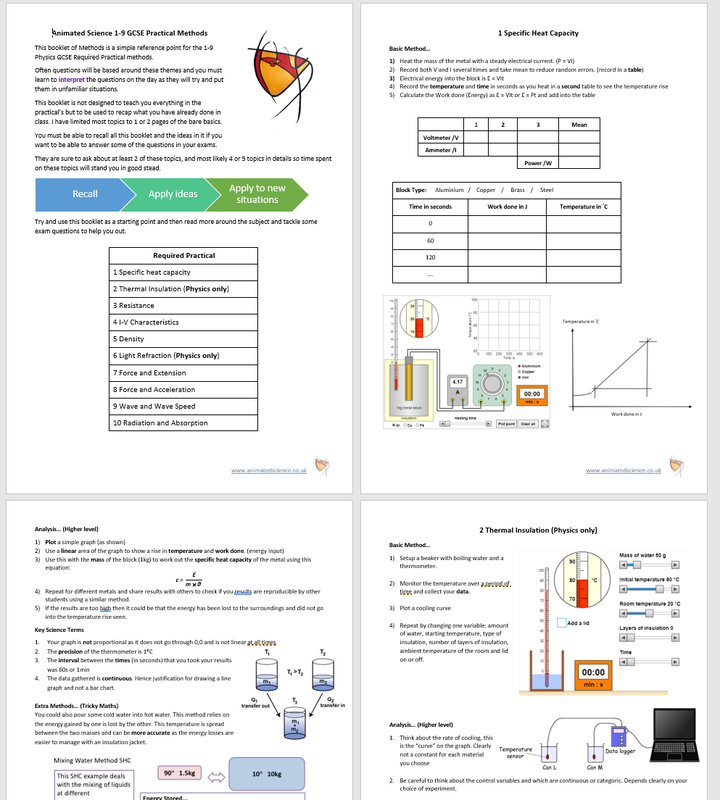 This booklet of Methods is a simple reference point for the 1-9 Physics GCSE Required Practical methods. Often questions will be based around these themes and you must learn to interpret the questions on the day as they will try and put them in unfamiliar situations. This booklet is not designed to teach you everything in the practical’s but to be used to recap what you have already done in class. I have limited most topics to 1 or 2 pages of the bare basics. You must be able to recall all this booklet and the ideas in it if you want to be able to answer some of the questions in your exams. They are sure to ask about at least 2 of these topics, and most likely 4 or 5 topics in details so time spent on these topics will stand you in good stead. Try and use this booklet as a starting point and then read more around the subject and tackle some exam questions to help you out. I have also included some more help on each of the Key Terms you need to know as well. It can be viewed as a PowerPoint or PDF…. If you want to do a lesson on iGCSE Electricity 2.2 understand how the use of insulation, double insulation, earthing, fuses and circuit breakers protects the device or user in a range of domestic appliances. Here are some resources to help you. I have attached all the lesson slides and if you work through this, you can then do an iSpring Quiz. This post is to celebrate a moment in time from 1994 when Gloucester Youth Orchestra played at Cheltenham Town Hall. On this occasion a recording was taken on DAT tape and some copies made for the players to listen to their own music. Having had this tape cassette in my car for the past 10 years or so I decided to digitise the whole concert so it was preserved for the rest of time on youtube. I have not altered the recording or cleaned up any noise so please realise this is not a perfect recording but simply a memory to share with any of the other players at GLO at that time, and also for future musicians to be inspired. I have included an image of the full orchestra compliment which also included some guest players on the day. Charles Peebles who has gone on to conduct many other orchestras in the past few years. Diggory Seacome – musical director – went on to become a Conservative Councillor! If you wish to do a bit of revision or learning on KS3, 4 or 5 space. Then try some of the resources here, you can have a PPT or PDF. Feel free to use for school use, but all images are copyright so no profit or derivatives which you sell! It’s as if a switch has been flicked. Evidence is mounting that chronic fatigue syndrome (CFS) is caused by the body swapping to less efficient ways of generating energy. Also known as ME or myalgic encephalomyelitis, CFS affects some 250,000 people in the UK. The main symptom is persistent physical and mental exhaustion that doesn’t improve with sleep or rest. It often begins after a mild infection, but its causes are unknown. Some have argued that CFS is a psychological condition, and that it is best treated through strategies like cognitive behavioural therapy. But several lines of investigation are now suggesting that the profound and painful lack of energy seen in the condition could in many cases be due to people losing their ability to burn carbohydrate sugars in the normal way to generate cellular energy. Instead, the cells of people with CFS stop making as much energy from sugar as usual, and start relying more on lower-yielding fuels, such as amino acids and fats. This kind of metabolic switch produces lactate, which can cause pain when it accumulates in muscles. Together, this would explain both the shortness of energy, and why even mild exercise can be exhausting and painful. Øystein Fluge of Haukeland University Hospital in Bergen, Norway, and his colleagues studied amino acids in 200 people with CFS, and 102 people without it. The levels of some amino acids in the blood of women with CFS was abnormally low – specifically for the types of amino acid that can be used by the body as an alternative fuel source. These shortfalls were not seen in men with CFS, but that could be because men tend to extract amino acids for energy from their muscles, instead of their blood. And the team saw higher levels of an amino acid that’s a sign of such a process. “It seems that both male and female CFS patients may have the same obstruction in carbohydrate metabolism to energy, but they may try to compensate differently,” says Fluge. Both sexes had high levels of several enzymes known to suppress pyruvate dehydrogenase (PDH), an enzyme vital for moving carbohydrates and sugars into a cell’s mitochondria – a key step for fully exploiting sugar for energy. Fluge thinks PDH is prevented from working in people with CFS, but that it can spontaneously recover. Several studies have now hinted that defects in sugar burning can cause CFS, but there is still uncertainty over how exactly this is disrupted. However, a picture is emerging. Something makes the body switch from burning sugar to a far less efficient way of making energy. “We think that no single enzyme in metabolism will be the answer to CFS, just as no single enzyme is the ‘cause’ of something like hibernation,” says Robert Naviaux of the University of California at San Diego, who has found depletion of fatty acids in patients suggesting they were diverted as fuel. So what could flick the switch to a different method of metabolism? Fluge’s team thinks that a person’s own immune system may stop PDH from working, possibly triggered by a mild infection. His team has previously shown that wiping out a type of white blood cell called B-cells in CFS patients seems to relieve the condition. These white blood cells make antibodies, and Fluge suspects that some antibodies made to combat infections may also recognise something in PDH and disable it. The team is now conducting a large trial in Norway of the cancer drug rituximab, which destroys the cells that make antibodies, in people with CFS. Results are expected next year. Together, these metabolic approaches are suggesting that CFS has a chemical cause. “It’s definitely a physiological effect that we’re observing, and not psychosomatic, and I’ll put my head on the block on that,” says Armstrong. However, he adds that psychological and brain chemistry factors might be involved in some cases. 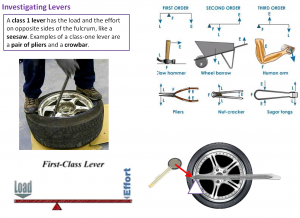 Investigating Levers – Stretch Project! 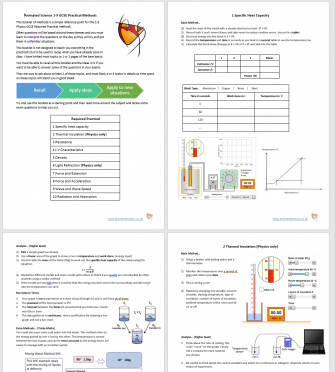 Investigating Levers AQA Triple Science P3 – Stretch Project! a fun practical way. It requires some tricky kit, so you might need to go do to the local tyre shop to see if they will let you have a go! Safety: to avoid cuts or crushing injury wear gloves and heavy duty shoes, in case your hands slip on the lever as you apply forces. Calibrate a resistance based force sensor using weights and a multi-meter set to ohms. Create a graph so you can convert resistance to a specific force. Put car wheel on the floor on its side. Put markings for distance on a tyre lever every 0.05m from the pivot point and pivot point itself. Hold the lever with one hand at the nearest point to the pivot, apply enough force to pull the rubber over the rim. Record the distance, reading on the multimeter in a table then use the graph to convert to a load force which should also be recorded. Replace the rubber and repeat steps 5 and 6 but 0.05m further away. Record all the results in a table. Graph the load force v distance from pivot and look for a pattern. Repeat with a 2nd wheel and compare graphs. Temperature may have an effect on the force sensor so all results must be collected on the same day and in the same place.